Planting bulbs in your garden has to be the most cost effective way of getting colour in your garden. Buying bulbs online or at your local garden centre, is so cheap and easy, bulbs costing less than 20 pence. Such great value! See below for my hints and tips on some what to plant and when they flower to give you months of interest. Autumn is the to plan and plant your spring bulbs colour for next spring. If your bulbs need refreshing, or you are adding them for the first time, October is the perfect time for planting spring bulbs! There are a wide variety of bulbs to choose from that will look great in the borders in spring. They can add a great contrast of colour to the garden. Tulips can offer colours from the deepest purples, to oranges, pinks and white, and they bloom at a time of year where many plants offer muted colours. 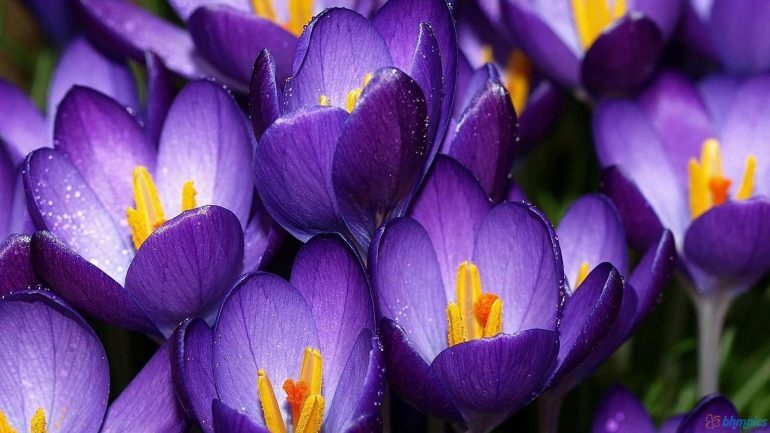 Others such as Daffodils, snowdrops, scillas, alliums, crocus, muscari, hyacinths and fritillaria offer great colours and shapes to the garden. When planting bulbs it is key to think about what time everything will be in bloom and how they will look amongst other shrubs and perennials. Make sure that the bulbs are healthy; they should be plump and firm. Discard any that are soft or showing signs of rot. Make sure you plant bulbs in their preferred location. Bulbs should be planted in well-drained soil, if your soil is heavy it may be some prefer sun, others shade. They should be planted two to three times the bulbs depth and two times its width apart. Try throwing them down and planting them where they fall, rather than in neat rows. Make sure when you plant the bulb that the ‘nose’ is facing upwards; if unsure plant the bulb on its side. After planting water the bulbs thoroughly to help them settle into their new environment and close up any air pockets that may have been left behind. Avoid stepping on the earth where a bulb has been placed as this can cause damage to the bulb. It may be worth placing netting over where the bulb is planted to avoid mice and squirrels digging up the bulb. Now they are planted, sit back and wait for the little jewels to appear in your garden next year.